Our solarium sunbed is an UltraTan turbo sun bed. Before visiting our tanning shop it is important that you consult your doctor if you have very fair skin, e.g. red/blonde hair and blue eyes, or lots of moles before commencing this type of treatment. To replace lost moisture, you’ll need to moisturise your skin after treatments to keep your skin supple and to prolong the tan. You should not take more than three sessions a week with at least a day in between sessions. If you are going on holiday it’s best to do 6 sessions over 2 weeks before you leave to build up a nice base colour. 1 session a week after you return will keep your colour. Our solarium sun room provides you with a tan without risks. Bibas detoxifying body treatments remove dead skin and increase blood circulation. Improve the overall appearance of your skin. 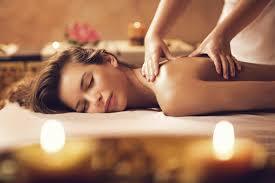 Get pampered and discover your inner stress free self with the best massage in London. Full body, upper body and stress relief massages available.